Overcharge: Deal extra damage against Dragon enemies. 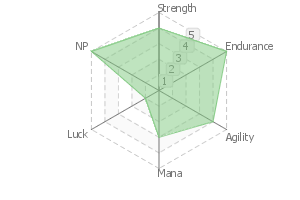 Increase NP Gain of all allies by 15% while he's on the field. The hero to take on thousands, as sung in the "Nibelungenlied." 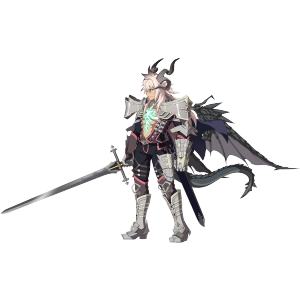 With his sacred sword Balmung in hand, he is the "Dragon-Slayer" who defeated the evil dragon Fafnir. Reticent, but passionate, he's always in the frontlines protecting allies on the battlefield. My back is eternally exposed because of my curse. 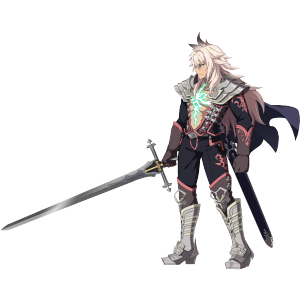 Siegfried is a great hero who appears in the song "Nibelungenlied" from the middle ages. He had many adventures, and in the process acquired the sacred sword Balmung and a cloak of invisibility. He ultimately brought down the evil dragon Fafnir. 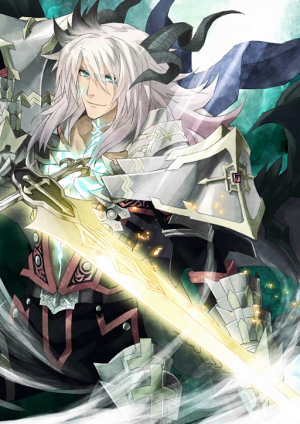 Bathed in dragon blood, Siegfried became immortal and could never be injured in battle again. But in his extravagant glory he started to see shadows around him. Especially when he married Kriemhild, the princess of Burgundy. Because he helped his brother-in-law, his sister-in-law and Kriemhild fought each other. Siegfried was caught between them all, and forced to commit suicide to avoid a feud. The last thing people wished of him, in a life where he kept answering to people's requests, was his own death. The sword of twilight, which holds properties of a demonic sword. The blue gem embedded into the hilt stores True Ether, which can be used to invoke the sword's True Name. As a Heroic Spirit, he looks back on his life as "a hero wished by many," and starts to harbor his own dream. He will no longer fight "for someone" but for his own ideals as a hero of justice... that is his dream. The hero matching a thousand admired in the "Nibelungenlied". With the holy sword Balmung in hand, the "dragon slayer" who defeated the evil dragon Fafnir. Although taciturn, his passions run deep. In the battlefield, he is constantly in the front lines protecting his comrades. 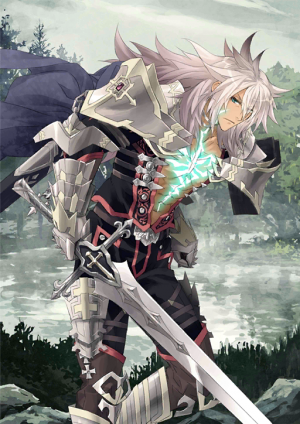 Siegfried is a great hero introduced in the epic poem of the Middle Ages, the "Nibelungenlied." 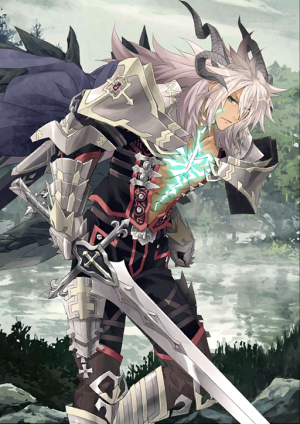 After going on many adventures, and in the process obtaining the holy sword Balmung as well as an overcoat that makes him disappear, he finally defeated the evil dragon Fafnir. 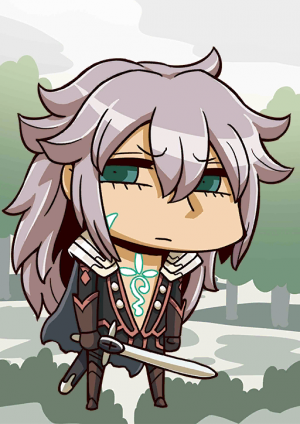 By bathing and drinking the Dragon Kind's blood, Siegfried became an invulnerable existence and would no longer receive even a single wound in the battlefield. However, a shadow was cast on such flamboyant glory around the time he married the princess of Burgundy, Kriemhild. 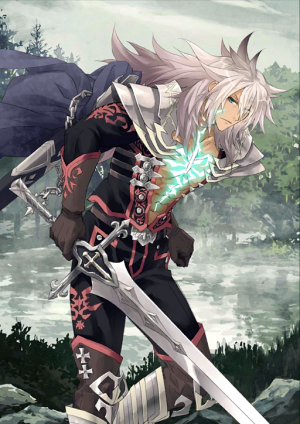 As a result of granting the wishes of his brother-in-law, Kriemhild and the wife of his brother-in-law got into a conflict with each other and Siegfried was driven into a situation where he had no choice but to die in order to prevent a fight. He had always answered to people's expectation, but what was wished from him in the end was his own death. Having turned into a Heroic Spirit, he looks back at his lifetime to his self as a "hero wished by others" and harbors a modest dream. To fight not for "somebody else's sake" but only for the justice he himself believes; an ally of justice--That is his dream. Balmung: Phantasmal Greatsword, Felling of the Sky Demon. A sword of twilight that possesses attributes as a magic sword. True Ether is being stored in the blue jewel inserted on the handle, which is employed by invoking its True Name. 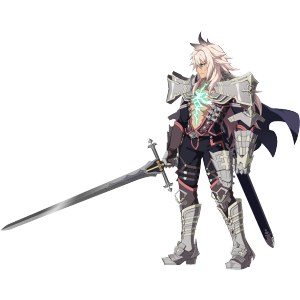 Siegfried is the only Servant in the game to start with access to two of his skills. Aside from Mash Kyrielight, that is. This page was last modified on 30 December 2018, at 10:31.